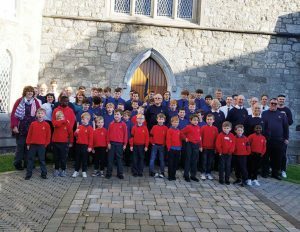 The four Companies in Dublin along with friends, parents and Past Members had a very different day on Sunday, 21 October. The Companies agreed that the event should be changed from a “Church Parade” to a fun event which the young people will remember for years to come as a great way to celebrate the inspiration of William Smith when he founded The Boys’ Brigade 135 years ago. After a picnic lunch in the grounds of Clontarf Parish Church (HQ of the 12th Dublin), there were lots of fun events for Anchors, Juniors and Company/Seniors. They were joined for a service of thanksgiving for the Founder led by our National Chaplain, Mark Acheson accompanied by music by Ichtus.